Skilcraft Clear Overlay 3-Ring Binder - Letter - 8.5\" x 11\" - 3\"
Round-ring view binder features a clear overlay on the front, spine, and back covers. Ideal for presentations. The clear overlay allows easy customization. Use pockets on the inside of the front and back cover for storing unpunched and loose papers. 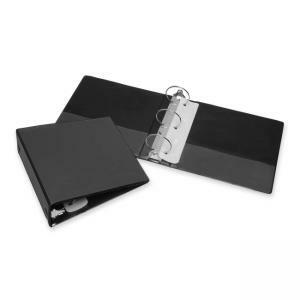 Three-ring binders accommodate letter-size punched paper. Heavy-duty vinyl-clad cover resists tearing and cracking. Binder is made with a minimum of 59 percent post-consumer recycled material and 63 percent total recycled material measured by total weight. Binder meets CPG guidelines and is made using a Bisphenal-free (BPA) process.